There are many lily varieties on the market now and we all know how to plant them for the best results. Or do we? We have had many different people tell us how they plant their lilies. Most of them beggar belief. So we thought we would show you how to select the best bulbs, and why, and then how we plant them, and why, so you can have the same success growing wonderful lilies as we do. On the bulb size diagrams, we have shown 'A' grade bulbs through to 'D' grade bulbs. What does this mean? What can we expect from them in reality? 'A' Grade bulbs are mature bulbs. You should expect 6 - 8 flowers per stem. 'B' Grade bulbs are semi-mature bulbs. You can expect 2 – 4 flowers per stem. 'C' Grade bulbs are young bulbs. You can expect 1 – 3 flowers per stem. 'D' Grade bulbs are named 'bulbil'. You may or may not get a flower from this size. Most nurseries carry A and B Grade bulbs. Bags of specially discounted bulbs are generally C and D Grade bulbs. Always remember that you pay for what you get and that saying is applicable here too. If you are not sure what size the bulb is, ask before you buy. On the planting diagram to the left, each bulb should be planted 3 times its width below the soil surface on its side. Why is this? Firstly, it is because your bulb may rot due to the rains during the winter months if it is planted facing upwards. The bulb creates a Well where the previous stem came from and the water accumulates there. Secondly, the stem needs to develop 'stem roots' which grow off the main stem for support. 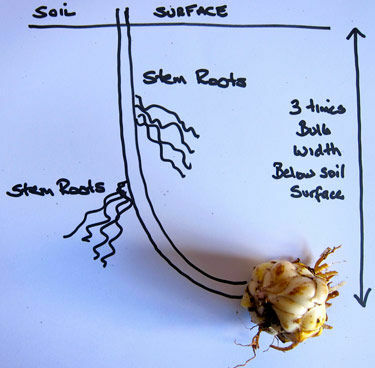 Thirdly, the 'stem roots' work as a massive nutrient and feeder for the plant and the bulb after flowering to build the bulb back up for next year. And last of all, the 'stem roots' aid in protecting the bulb from hot conditions. In cooler climates, your lilies can take full sun. In warmer climates, morning sun and afternoon shade are highly recommended. Fertilize your bulbs immediately after planting and after flowering. A bulb fertilizer (we use Osmacote) should be used. Remember when cutting your flowers, always leave one-third foliage as a minimum to continue feeding and build your bulb up for next year.